This LTspice Tutorial explains how to import third party models into LTspice®. It is important to note that LTspice looks at the first line of the SPICE model to determine how the model should be handled. If the part is defined with a .MODEL statement, importing the model is handled one way; if the part is defined with a .SUBCKT statement, importing the model is handled in a slightly different way. Thus we could import 2 identical diodes, one defined with a .MODEL statement and one defined with a .SUBCKT statement and they are actually handled differently. 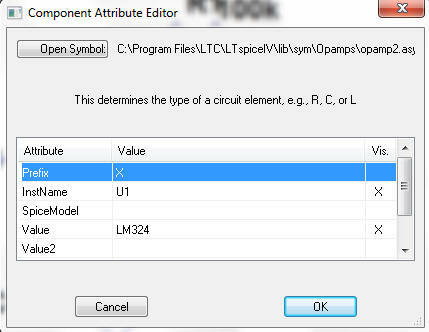 LTspice looks at the model definition, NOT the component to determine how to import the part. Download the SPICE model into the same directory as the circuit you are simulating. Make a note of the filename of the SPICE model, including the file extension. Open the SPICE model and note the name of the model - this is the text immediately after the .MODEL directive and before the part designator (in the case below this is the text DI_SBG1030L). The SPICE model can be viewed from within LTspice. Remove diode D1 and replace it with the standard Schottky diode from the LTspice library. Download the SPICE model of the BAT 54 Schottky diode: BAT 54 SPICE model and save it in the same directory as the circuit in FIG 1. To avoid spelling mistakes, use Windows Explorer to highlight and copy the filename including the filename extension (.txt). Paste the text after the include statement. Open the SPICE model file (using, say, Notepad) and note the name of the model (in this case it is DI_BAT54). Again, to avoid spelling mistakes, it is easier to highlight the model name and copy it. Press <CTRL> Right click over the Schottky diode symbol and paste the text DI_BAT54 into the Value field as shown in FIG 2. Do not put any comments in the Spice Model field. Run the simulation. The forward voltage drop should now be 290mV. Has the SPICE file been loaded into the same directory as the simulation file? Is the part name the same as that specified in the SPICE model? Does the filename in the .include statement exactly match the SPICE model filename? It is also worth opening the SPICE model file from within LTspice and checking its contents. Some text editors can add formatting characters that confuse LTspice. A similar procedure can be used to import more complex models. Follow the steps above, except when modifying the Component Attribute Editor (see FIG 2), ensure the Prefix attribute is marked as X (and not D as in FIG 2). We are now going to compare the performance of the LT6231, (215MHz low noise op amp) with the LM324 (low cost op amp). Running this circuit shows the output falls from 1V at dc to 0.707V at about 2.77MHz. Now remove the LT6231 and replace it with a standard 5 terminal op amp. This is the 'opamp2' model in the Op Amps folder in LTspice. 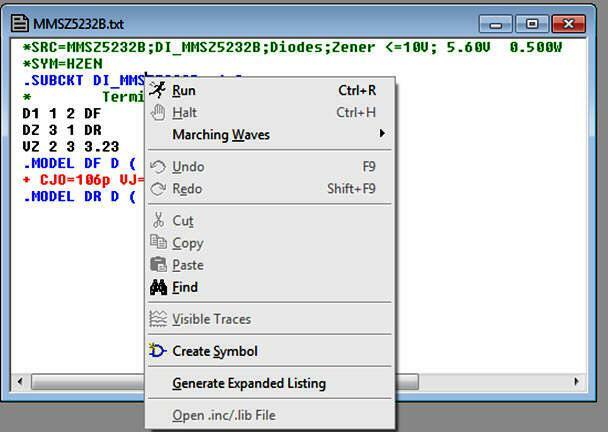 Download the LM324 model: LM324 model and save it in the same directory as the circuit in FIG 4. Open the SPICE model and make a note of the SPICE model name (immediately after the .SUBCKT command). In this case it is LM324. Ensure that the Prefix attribute is filled in with X. NOTE: The SPICE model of some simple components (e.g. Zener diodes) are defined as a SUBCKT. In this case, the Prefix attribute has to be 'X' and not 'D' to correspond with the .SUBCKT SPICE definition (and not a .MODEL definition). Once the SPICE model has been imported, an outline can be created for the part. 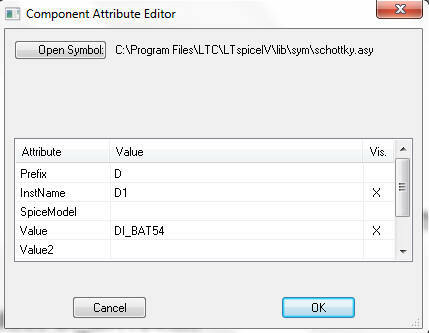 Open the SPICE model in LTspice, move the mouse over the .SUBCKT line, right click and select 'Create Symbol'. A square symbol will appear showing the nodes of the SPICE model. Then select a new component (using the AND gate symbol) and in the dialogue box, the new component is stored under the [AutoGenerated] directory. Running the simulation shows the output falls to 0.707V at about 10kHz, showing the inferior frequency response of the LM324 over the LT6231.